Custom embroidered towels & embroidered robes; include finger tip, hand towels, beach towels and golf towels. The main brand being Port & Company. A variety of styles and colors fill this page. Included your embroidered logo for a finishing touch. A great company promotional item. Custom embroidery included in price. Port Authority ® Microfiber Golf Towel. TW540. Custom embroidered Port Authority ® Microfiber Golf Towel. TW540. Keep your hands and clubs cleaner with this lightweight, ultra absorbent, odor-fighting towel. 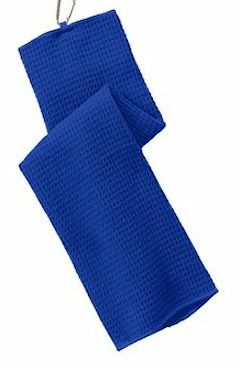 85/15 poly/nylon microfiber, Fully hemmed for a clean look, Dimensions:24.25"w x 15.25"l; 4 lbs/doz. Custom embroidered logo included. Port Authority ® Grommeted Microfiber Golf Towel. TW530. Custom embroidered Port Authority ® Grommeted Microfiber Golf Towel. TW530. A handy carabiner allows you to hang this lightweight, absorbent, odor-fighting towel off the golf bag. 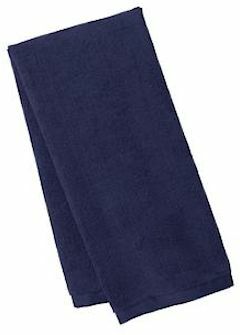 85/15 poly/nylon microfiber, Fully hemmed for a clean look, Dimensions:24.25"w x 15.25"l; 4 lbs/doz. Custom embroidered logo included. No golfer should be without this lightweight, quick-drying, super absorbent, odor-fighting towel. Tri-fold with center silver carabiner secures it to the bag. 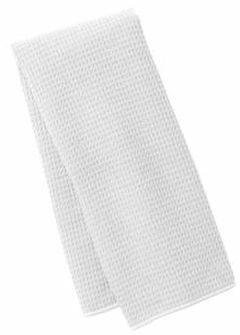 80/20 poly/nylon microfiber, Waffle texture, Fully hemmed for a clean look, Dimensions:24.25"w x 15.25"l; 4 lbs/doz. Custom embroidered logo included. Workout-ready, this ultra light, quick-drying, ultra absorbent towel fights odors and is ideal for the gym, spa, travel and more. 80/20 poly/nylon microfiber, Waffle texture, Fully hemmed for a clean look, Dimensions:14"w x 32"l; 4 lbs/doz. Custom embroidered logo included. The custom embroidered Port Authority ® - Grommeted Tri-Fold Golf Towel. #TW50 is an essential Tri fold golf towel for any golf outing. 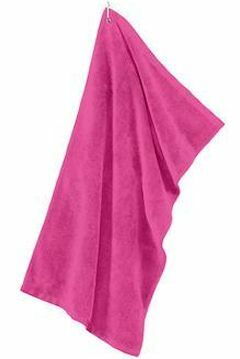 100% cotton terry velour, Fully hemmed for a clean look, Grommet and hook to hang towel off bag, Dimensions: 16" x 26", 3.5 lbs/doz. Custom embroidered Port & Company ® - Beach Towel. #PT42. 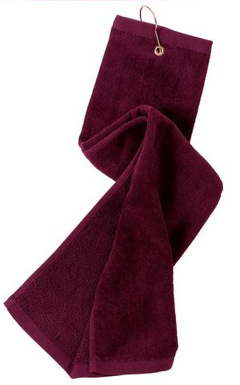 100% cotton terry velour, Dimensions: 35"w x 62"l; 14 lbs/doz.